Yesterday Michelle and I went to see the movie Ted at the theater. I have to be honest it was a movie that I wanted to see since I first saw the movies Red Band Trailer earlier this year. I knew that I had to see this movie this summer. Yesterday the movie opened up nation wide and Michelle and I took advantage of a little bit of time off from work to see the movie and do a little Red Lobster for Dinner. I have to say, I almost lost my breath not once, but twice during the movie. Chad wants to see it but Michelle is afraid he will bust a stitch out from his recent surgery from laughing so hard. I have to say there are times when you see a trailer and a movie looks good but all the highlights are in the trailer and it's a big disappointment. This is NOT one of those movies, as funny as the trailers are, they just can not do the movie any justice. It may be the funniest movie that I have ever seen in my life. There were a number of cameos that had you laughing as well, and the one liners will cause you to bust a gut. This is a movie that will make you laugh and cry and leaving the theater feeling that you got more than your money's worth. I would HIGHLY RECOMMEND to anyone who likes Family Guy and Seth Macfarlane's witty brand of humor to not miss this. This was a world series winning walk off grand slam. I have a big squirt gun somewhere around the house. It's one that I have had for an awfully long time and bring out once a year. The day that I bring it out is the day of the year that we have a very bug water battle at the Rosiak 4th of July party. Today is that day and I'll be bringing out the big gun to soak all who get in its way at our annual water battle. 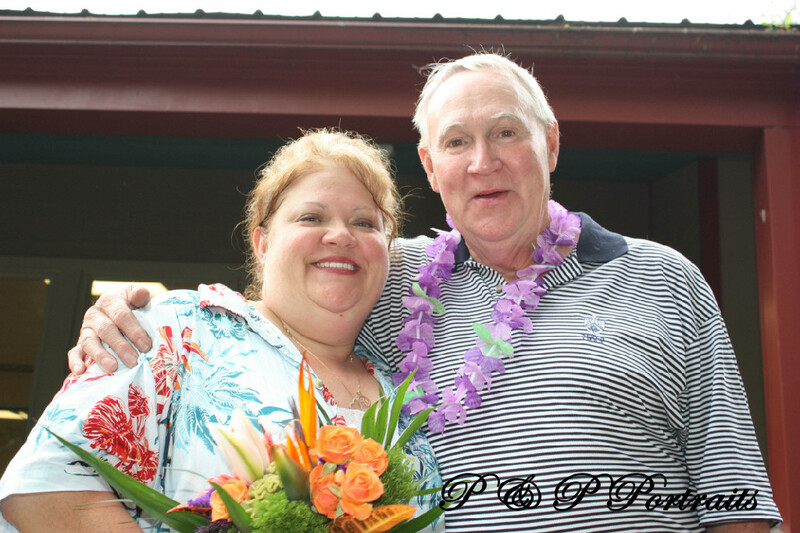 Trish's Mom and Dad, Pat and Frank have a big 4th of July Party every year. This will be my 15th straight year of having the honor of getting an invitation and attending the party. Game on for the water battle, I hear Layla wants to get me today. I would like to take this opportunity today to wish Michelle's son Chad a very Happy 24th birthday today. He's a hard one to get a picture of, so I had to look and find one that I had, but I found one from Christmas last years. If you see Chad today make sure that you take a little bit of time out and wish him a very happy birthday today. He's still recovering from his surgery, but he seems to be getting better and better as every day passes. I'm not sure what his pland are for the day, I guess it all depends on if Laiah is working today or not. For Michelle and myself however, it's a day of recovery from yesterday. The show went great, it was in the mid 90's all day and even into the evening. We did have a nice cool breeze blowing through our EZ-Up and gave us some relief on the day. It was a great day, I can't wait until next years concert so we can do this all again. 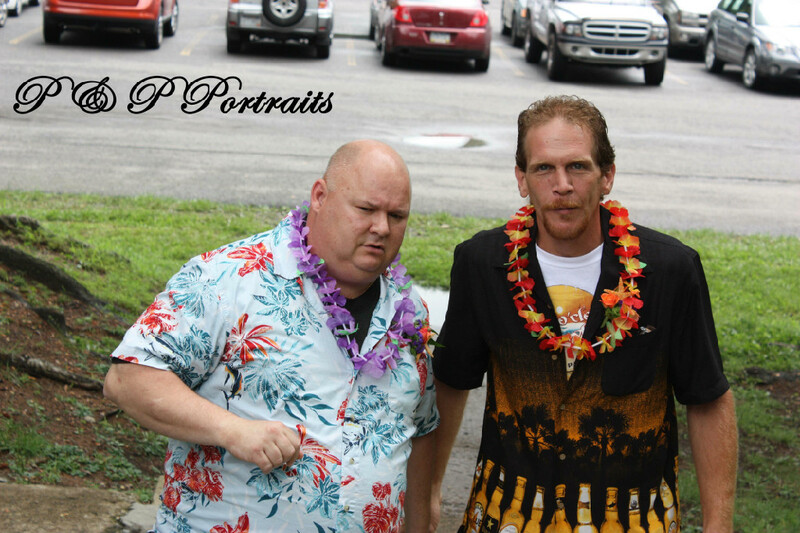 The parrotheads were out in full force yesterday giving Jean and Gary a very memorable first Buffet show. Jean was dancing the whole night long and it seemed like everytime you turned around she was hugging some young piece of female eye candy and trying to hook Gary up. It was memorable. No free movies tonight at BOPARC, but the movie TED is coming out today and I think Michelle and I are going to try to go and see it. We still have some unpacking of the car to do and she has some family coming into town for a few hours today that she wants to visit. She hasn't seen them in a few years and they are passing through today on their way to Myrtle Beach. Have a great day, we're going to try to recover. Once a week I like to take a little bit of time out and look through the thousands of digital pictures that I have on my computer and find just one special image to blog about. Briefly reliving that lost moment in time forever captured in a digital image. Sometimes it's easy to find a picture and sometimes it's pretty difficult, it's always a whole lot of fun. This weeks image takes me back a few years, a day that forever changed my life and my indoctrination into the world of being a parrothead. 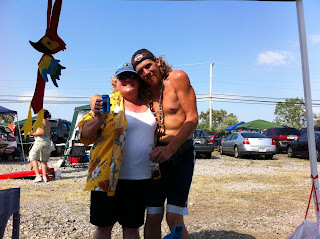 This was taken at the tailgate of my first Jimmy Buffett Concert (not my last) a few years ago. 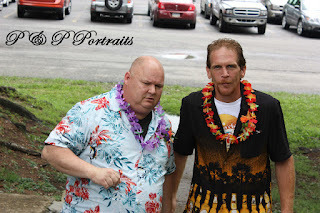 Mark Devault had told me for years how much fun going to a Jimmy Buffett concert was, that year the concert was at PNC Park and it was HOT HOT HOT that day for sure. We went early in the day and Mark, Denise and a friend of Mark's tailgated all day right beside the stadium giving me my first experience to the parrothead nation. Today in Burgettstown it will be 95° and scorching HOT HOT HOT. 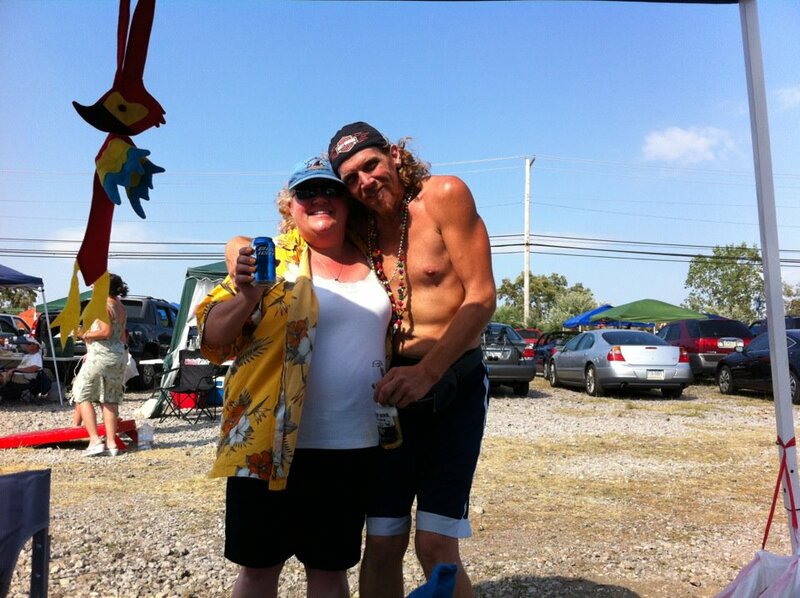 The parrothead nation will once again assemble and Michelle and I plan on being there once again. This will be my sixth concert and Michelle's fifth. 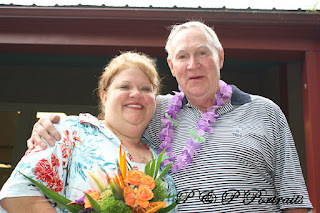 The pleasure today as a big thank you for doing so much for us last year for our wedding is the ability to partially repay Jean and Gary for the enormous amount of help they both gave us last year for the wedding. No one went away hungry and people still talk to me about all that food. Today I get to give them both a little thank you as we indoctrinate them into the world of parrotheads. I hope you have a great day, we plan to. 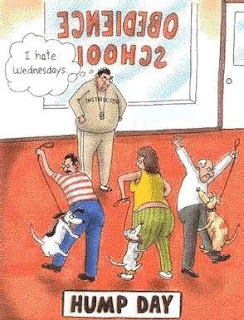 It's Wednesday, the middle of the week that signifies the weekend is not too far away, but for some of us this is the start of a four day weekend. For me and Michelle, this is the start of a four day weekend. With the Buffett concert tomorrow night, we'll be tailgating most of the day tomorrow and recovering on Friday from our venture into the parrotthead nation. This is the only long weekend like this we have planned for the summer, we're taking our vacation in September when we go on our cruise, so this will be our longest extended weekend of the summer. Michelle wants to save some of her vacation time for after Thanksgiving when we go back to where she is from for her High School Reunion. * Well Monday is now in our rear view mirrors and we are staring straight down the barrel of a Tuesday, I for the life of me can't think of a better reason than that to do a tidbits. * It's been 1,565 days since that first date with Michelle a few years ago. My life has been better for it ever since. * It's been 788 days since our engagement. I think when we became engaged Michelle thought I was going to make her wait another 777 days before I married her. * That being said, we've been married for 325 days now. * There are 182 more shopping days left until Christmas. * In 75 more short days we will be setting sail to the Bahamas. Ironically if it wasn't already paid in full they would be taking the balance of what we owed today to ensure our early bird discount.It's all paid for however including the tips. * In 2 more days, we're going to Pittsburgh to join the Parrot Head nation once gain and see Jimmy!!!! Fins Up!!! * I updated my geospatial software at work yesterday. I'm now running the new 10.1 software, they used version 10 as a half transition from the 9 Suite and 10.1 is the completely different software. Everything changes from the license manager to no longer being able to run VBA and having to write everything in Python. * Chad is still sore, but is still getting better day by day. * I have a Doctors appointment this morning. I'll go check in between a few meetings today. * Cardio day this morning. Well it's time for me to stop enjoying my fun filled three day weekend and get ready to go to work the next three days. I do this so I can continue to enjoy the things that we look forward to on the times that we don't work. Going to be a short week for me, going to make next weekend a four day weekend as we head out to see Jimmy Buffett this Thursday. 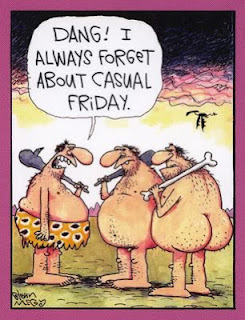 So we'll take of Friday too because it is an all day event Thursday and we'll be getting home early Friday Morning. Chad is doing well for all who are concerned. With each passing day he is in less and less pain and starting to get around a little more. It'll still be another two to three weeks before the doctor completely releases him to no restrictions, but he is recovering nicely. On a sad note, a damn deer has eaten all of our pepper plants. Last night I walked out and even caught saw it in the back yard. I feel a man vs deer winner take all to the death wrestling match coming on pretty soon. Buy your tickets now. Speaking of, off to the gym to train. A few years ago Val decided it was much easier to have one bigger party than to have two parties a month or so apart for the kids. So she picked a date somewhere in the middle and we celebrate both Erica and Josh's birthdays together. Last year we did it at Marilla Park and it was nice for us in the older crowd, we recalled the pic nics we used to have with my Dad at the same location. The Food fights and the good times, last year gave the next generation and the ones who had never experienced it a chance to live it. This year since Val now has her pool open and the temperatures are due to be in the upper 80's today she is having it once again at her house this afternoon. Both Michelle and I will be there with our camera with us taking a few pictures. You never know maybe one of today's pictures will be used for a Photo Flashsback someday recalling the moment in time that was captured. I have to say this is always one of the high points of my summers. Once again I sit in a quiet household, Michelle is sleeping after an exhausting day yesterday and I'm up early in the AM to collect my thoughts for the day. Some movie is playing on HBO, not even sure what it is and just planning out the rest of the day. If Chad is up to it, and he meets certain criteria like walking and a bowl movement he will be allowed to come home as early as today. I know it's been a while since he has slept in his own bed, first with going to DC to work and then on the day that he gets back having this trouble. I know he is wanting to be home. For Michelle and me, it's going to be a trip to Sam's this morning, a trip to the hospital and that is probably going to be the extent of our day. I know she is just mentally drained from the events of the past week. We went down for surgery a little before noon. His surgery was supposed to take place at 12:30, but the anesthesiologist was having trouble with an older patient and they did not get him back into the operating room until about 2:00. Dr. Johnson told Michelle it should take about an hour, any longer and he has probably ran into complications and advised her that he may have to have a colostomy bag in the worst case scenario. The surgery did last about an hour, and the Diverticulitis that was initially diagnosed as the problem was not the problem. His colon was/is in very good shape with the exception of a little bruising. It seems a fatty deposit on the outside of the colon was the problem. Dr Johnson said he has seen this three or four times and there is no answer as to why they start to appear and grow. It left a very sticky residue that needed to be cleaned out. His Gall bladder was fine, his colon was fine, but there was some slight bruising on his appendix and they opted to remove it to prevent it from causing any problems in the future. They brought him out of the recovery room at about 5:00 (two hours after conclusion of surgery) and he was sick and in pain, which could be expected. Prognosis is good and he should be able to come home tomorrow. My Friday however may be non existent or cut short today. Chad is having surgery and Michelle and I are going to be there for it, Laiah just started a new job yesterday and has to work all day, Hayley has to work all day so it'll probably be the two of us at the Hospital. For those of you looking for a little cheap, and by cheap I mean free entertainment, Movies in the Park tonight is playing the movie Puss in Boots this evening at Jack Roberts Park. They will start the festivities at 7:00 and will have the bounce house up and running for all the little ones. Michelle just found out this morning, they are planning on operating on Chad tomorrow sometime around noon. We stopped up last night and they still had not returned with the results of the Cat Scan yet, but Michelle saw hi surgeon his morning. He's still in a lo of pain and wants this whole ordeal to be over with. Worst case scenario is that he may have to have a colostomy bag installed, but it could be a temporary thing. Please keep him in your thoughts and prayers tomorrow as he enters into this operation. It's once again that time of the week when I take a little bit of time out and look through all of my older pictures and select just one picture to tell a little story about. Some times it's pretty easy finding that picture and sometimes it's pretty difficult, but it is always a lot of fun and one of my favorite blogs of the week to write. I thought I would celebrate yesterday being the first day of summer with a picture of a group of guys I used to refer to as the boys of summer. If you know me, I played softball for a lot of years at BOPARC, I'm currently in my second year of retirement with another goal in mind, but my heart will always be on the fields. It was the time of the year that I always looked forward to the most and I was fortunate enough top play on a number of pretty good teams through the years. The photo from this weeks flashback is an old photo of the last year we were Prime Time. We had lost a few players from the Championship run the year before, but we picked up a few players too. This was the season we got moved up and were tearing up the league until we got to the playoffs and the team we played magically was about 10 players different than what we had clobbered earlier in the year. IOW they picked up a bunch of illegal roster players, most of which were open flight players, and they turned the table on us. I miss playing the game, half of me wants to continue to play but I know I can no longer compete at the level that I want to. My heart will always be out on those fields though. Some of my fondest memories. Monday and Tuesday are now behind us, now if you take a little peek over the noon time hump and just on the other side of a Photo Flash back you can see the dawn of yet another fun filled weekend. 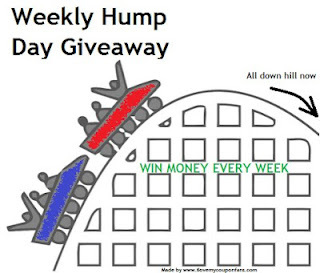 Today, is over the hump day, it's all downhill from here. To all of you from the great State of West Virginia, celebrate our states 149th birthday today. I have to say that I was born a Georgia Peach, but my heart and my home will always be Morgantown, West Virginia. It's where I am from and it's where my family lives, so I can take great pride today and help my state celebrate it's birthday. Chad was scheduled to have a Cat Scan yesterday evening, as of the time of me writing this blog (he's probably under the CT scanner as I type this) I do not know the results yet. I know that he is still in a lot of pain and surgery is most likely going to happen pretty soon. I have been holding down the home front, making coffee, feeding animals, watering the garden, making dinner, and other things so that it frees up some of Michelle's non working time so she can be at the hospital. Once we definitely know there will be surgery, she'll probably take that day off, but we're just sitting back and holding our breath waiting for someone to make a decision or for him to get better. I would like to take this opportunity to wish a very beautiful and a very special little girl a very Happy Birthday today. Erica Jean Nicholson turns the magical age of 8 years old today. It seems like it was only yesterday that she was born, and Val and Bobby became parents for the first time. Val has a party scheduled for Erica jean this Sunday, we'll all get together and have cake and ice cream and watch Erica open all her wonderful birthday presents. If you see Erica Jean today, make sure that you wish this precious little girl a very Happy Birthday. * Once again Monday is in our rear view mirror and we are staring straight down the barrel of a Tuesday, I can't think of a better reason than that to do a tidbits. * It has been 1,558 days since mine and Michelle's first date, I set a new record every day. * It's been 781 days since I got down one knee and proposed marriage. * It's been 318 days since our wedding. * Only 189 more shopping days left until Christmas. * We set sail in 82 more days. * 9 more days (single digits) until we party down with Jimmy Buffet. * Chad had been diagnosed with diverticulitis, if he is still in pain this morning after all of the anti-biotics and pain meds they have given him, they may have to operate. As of last night, he was still in a lot of pain. * Our patio garden is doing very well this year, we decided to stick with one Tomato plant, a bunch of peppers and some cucumbers. I think the first thing that will come to maturity will be a jalapeno pepper. Tomatoes are coming along fine. It's time to stick our noses back on the grindstone and get back to work for another week. 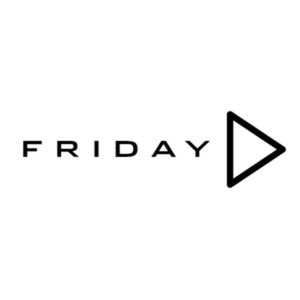 Get back to doing the things that we do that allows us to enjoy our weekends so much. Chad is still in the hospital, we'll know more today after hearing from the Surgeon. Looks like he is going to be in there for a few days and possibly having surgery. I'll keep everyone updated as to what is going on as we know. Michelle was with him all day yesterday as Laiah came and rested a little bit here. Hopefully Michelle got some rest last night as she didn't get a lot of sleep and rest over the weekend. It's a back to work kind of day for me, another project I am working on launched last week. The EDX or Energy data Exchange is now live but not really published. We're still gathering data and information to put into it, but it is out there. I woke up this morning and thought it was a little extra quiet here, come to find out later in the wee early hours of the morning that Chad was having severe stomach pains last night and Laiah took him to the hospital. He was admitted last night at Mon General and may have to stay a day or two for observation. They have run a number of tests so far, and everything seems to be pointing back towards his gall bladder.He'll have an ultrasound sometime today and we'll know more. Looks like it might be surgery for him, good thing he's on my insurance. My boss pays for Super Blue Plus on Blue Cross and Blue Shield for the entire family, I am lucky to be working for such a great company. I would like to wish all the fathers out there a very Happy fathers Day today. Much like Mothers Day, Fathers Day is a day whose origins are from North Central West Virginia, despite giving credit to someone from Oregon two years later. It was originally a day set aside to honor the fallen miners of Monongah. The picture to the left I felt was pretty appropriate for me and today. The man on the far left is my own Father George Sr long before I was even thought of. 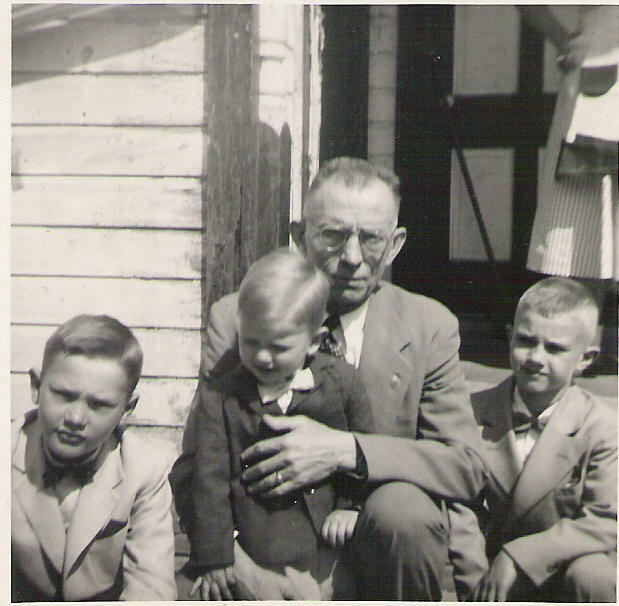 The man in the middle is the man who raised me until his passing when I was just a teen ager, my Grandfather Ellis Hall. Unfortunately for me both of these Fatherly influences have moved on and no longer with us. Grandpa Hall in 1977 and Dad 22 years later. I took a little bit of time out on Memorial Day to visit both of their grave sites as they were both the two most influential men to ever enter my life. 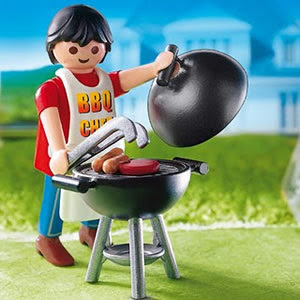 Happy Fathers Day, fire up the grills. Here I sit in a quiet household, Michelle is back home for a golf tournament and I am sitting here watch the Perfect Game on Netflix and thinking about what is going on today. Jim and Chris of P and P Auctions will be holding an Auction today at 6:00 PM at the Cassville Firehall.They have a number of items being auctioned today including furniture, an antique radio and judging by their listing even a pool table. We are planning on being there this evening, so if you are looking for something to do, attend an auction and come and meet some great people. You can always find a bargain on something very nice at one of their auctions, come on out and find your deal. There are no movies on the Mon again this weekend.However if you want to see a good band the Kentucky Headhunters will be playing at the Sagebrush Roundup tomorrow night. Ticket's are $30.00 each, and probably a bargain to see a band that once was one of the biggest up and comers in Country Music and a former headliner at the WVU Coliseum. Michelle will be traveling back home tonight to make ready for the charity golf event for her Uncle tomorrow. Terry passed away late last fall and they are having a charity golf event to raise money to sponsor a scholarship in his name. We've sponsored a hole as well as BFS has sponsored a hole thanks to Michelle also. She'll be there for the shotgun start tomorrow morning as I'm doing my shopping. That being said, I'm finding someplace to eat solo tonight. Once a week I like to take a little bit of time out and start looking through all of my old pictures that I have on my computer and find just one special image that I can write a little story about. Sometimes it's easy to find those pictures and sometimes it's not so easy to find that one special picture to talk about. It is however always a lot of fun looking back through the years and the images that I used to capture them. This weeks picture takes us back a number of years. Pam and George were having a birthday party for Calvin at their home, it was a time when George was just starting the edition and the house looked different. When this picture was taken, this was the kitchen and today it is their living room. Anyways Moke had started to play guitar around that time, my little brother Gary is a pretty decent guitar player himself, and was taking a little bit of time out to show Moke a few things. I actually even have a couple of movies of this picture when Gary was playing. The family had a good day that day, we celebrated Calvin's birthday, Erica Jean was just a newborn and Calvin was much much shorter than he is today. Well Monday and Tuesday are now behind us, and if you look just over that noontime hump and just beyond a photo flashback, you can see the dawn of another weekend. This week is starting to go by pretty quickly. I swear I am going to have to find myself a theme for Wednesday Blogs, they are usually the most difficult ones to write. It's the middle of the week, nothing is usually going on other than starting to make plans for the weekend and it is hard to find material to write about on these days. Apple introduced the new IOS 6 that is scheduled to come out this fall. One of the things I am excited about is the new mapping feature (I know I'm a geography geek). They are going to get away from Google maps and Apple is going to use their own state of the art mapping service that will debut this fall with the release of the iPhone 5. It will have higher resolution imagery and in many larger cities have 3d images of buildings including their real sides. Google earth uses a program called Sketch Up to design buildings in their software, what Apple is going to do as well as Android is pretty state of the art and will impress any geographer or cartographer. * Well Monday is once again in our rear view mirrors and we are staring straight down the barrel of a Tuesday, I can't for the life of me think of a better reason than that to do a tidbits. * It was 1,551 days ago that the path of my life would be forever changed as Michelle and I went out on our first date. * It was 774 days ago that I got down on one knee and proposed marriage (she thought I would wait another 777 days before I said I do). * 311 days ago I did say I do in front of our closest friends and family. * There are 196 more shopping days left until Christmas. * 88 more days left until we hit the Atlantic Ocean on our cruise to the Bahamas. * There are 16 more days left until we party down with the rest of the parrot heads in Margarittaville. * Michelle will be attending a Pampered Chef Party this evening. We held a book party a couple of years ago and walked away with a few hundred dollars worth of free or discounted merchandise. We love their products, we have a number of their cooking stones, measuring devices, rice cookers, bad sealers, garlic peelers and presses, Pineapple slicers, utensils, spring pans and a number of other devices. * I started lifting again yesterday, I am still in a great deal of pain so I may cut off the free weights briefly and concentrate on universal exercises. * Today however it will be a cardio day for me. All good things must come to an end, and unfortunately that includes weekends as well. It's time to stick our noses back on the grindstone for another week of fun and doing what it is that we do that allows us to live the way that we do. For me, I took off all of last week from working out. My shoulder was sore and my kidneys were killing me from something or another all last week. So I took the entire week off from lifting and cardio and lived it up for the week. Now it's back to the gym, and back to the trail this week as my shoulder is rested and my kidneys feel fine. It had been six months since my last workout break over the new Year and my body just needed a chance to heal itself a little. I have goals that I am trying to achieve by the end of the year as far as lifting goals. Chad is in DC for a few weeks and will be working downtown DC for the duration. Laiah is back and taking care of all of his animals while he is gone. I'll be on my own this Friday Night for dinner. It's the one day of the week Michelle and I go out for dinner, however she is going to be heading to her Mother's Friday night. He Uncle Terry passed away last fall (he was at our wedding) and they are having a golf outing for a scholarship in his name. Michelle and I have sponsored a hole and she wants to be there for the start of it Saturday before coming back home in time for the Auction this Saturday. As I sit here in the early AM, I'm the only one here that is awake as Michelle is in lala land unless one of the animals is stirring around which I don't see or hear. We had Amy's Baby shower yesterday which for the most part went pretty well. I would say she has a lot of things she needs to get started with the twins Urf and McGurf. Who ever organized this did a very good job and Amy and Ralph walked away with some money, gift cards, a whole bunch of diapers and a number of random gifts that she had on her registry. They played a game where you get a clothes pin and if you say the word "Baby" who ever heard you say it got to steal your pin. With a little help from Calvin I managed to get six of them and take first prize, which was a gift card to Wal-Mart that we turned around and donated to the Mother and Father to be. Today's agenda includes our normal grocery shopping and maybe get into a little something this afternoon, but who knows. Here I sit once again in a quiet household, it's just me and Michelle as Chad is in Pittsburgh and getting ready to go to DC to work for the rest of the month. I'm up early collecting my thoughts for the day. Amy's Baby Shower is this afternoon and I'll be going to keep Ralph company and take a few pictures for the day. Amy has asked me if I would take a few with her Camera and I agreed, hopefully she gets everything she needs today and everyone has a good time. Nothing on our agenda after that, but we'll be heading to Sam's this morning to see if we can find a deal or two and do our weekly bulk shopping. We like to get there early to avoid crowds and to see if we can find anything that we have been looking at that is a one time thing and on clearance. We've managed to find a couple of nice Cuisinart products that way. Have a great one. If you are looking for something to do tonight, there is no movie on the Mon tonight but there is the Arts Alive Festival this weekend at the Amphitheater. There will be all kinds of music, festivities and food and drink down by the river. If you are looking for something to do around town, this may be it. Tomorrow Michelle and I will be attending my Niece Amy's baby shower near her home. She asked me to come along and take some pictures for her using her camera, plus I'll be using mine as well to capture the moments of the day. That's about the only thing we have going on for this weekend. It's a special Birthday edition of my Photo Flashback Thursday. Once a week I like to take a little bit of time out and look through all of my pictures that I have and select just one special picture, one to tell a little story about and reflect a little bit upon. Some times it's an easy task, sometimes it is not, but it is always fun. This weeks flashback if you read my previous blog was pretty easy. Being today is Hayley's birthday and I spoke about her 16th Birthday party, I figured I could share a photo from that special day. I remember Michelle and I scraped up enough money to do something for her and we did so in a way that she had no clue as to what was going on. It was a day when both families joined together and a number of her friends were here that day to help us celebrate the day. I think this is a day I will always remember. I would like to take this opportunity to wish my step-daughter Hayley a very Happy 19th Birthday today. I was just telling Michelle yesterday morning that it's hard to believe that it has been three whole years since we had her 16th birthday party here. We surprised her that day and caught her a little bit off guard, but it seems like just yesterday. If you see Hayley today, make sure that you wish her a very Happy Birthday today. I'm not sure what her schedule is today as she may have to work, I'm sure I'll have more details by the time I write tomorrows blog. That's two days in, now if you just look over top of noon and off in the distance, you can see the dawn of another weekend just on the other side of a photo flashback. Every once in a while, even yours truly is speechless with nothing to really write about. I call these days brain fart blogs. Blogs when you really have nothing of any significance to talk about, but you want to keep the blogs going so you keep on writing. Today is one of those brain fart blogs. 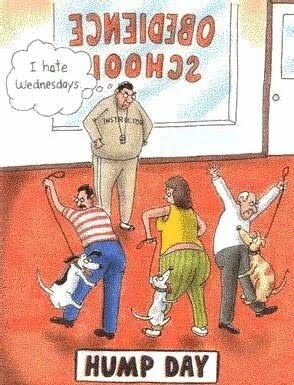 * Well Monday is once again in our rear view mirrors, we are looking straight down the barrel of a Tuesday. I can't for the life of me think of a better reason than that to do a tidbits. * First of all, once again Happy Birthday to my brother Gary. I think he just turned 21 again today. * Michelle called me yesterday afternoon. 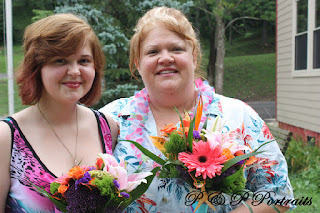 Her niece Amanda who just graduated from West Virginia University and is enrolled in her Masters Program this fall, got a great bit of news yesterday. She was awarded her Assistant-ship that she had applied for. What this means is her Masters Degree is now paid for by the University AND they will pay her a salary as she is working on her Degree. Congratulations Amanda. * It's been 1,544 days since mine and Michelle's first date a few years ago. * It was 767 days ago that we became engaged. * We have been married now for 304 wonderful days. * There are only 203 more shopping days left until Christmas. * We are down to 96 days now until we set sail for the Bahamas. And the Cruise is now officially 100% paid in full and reservations for the previous night in Baltimore where we set sail from are made. It's just a matter of filling out the passenger information, inputting our passports info and packing. I'm getting more excited. * 23 more days until we join with the rest of the Parrothead nation in Pittsburgh. I would like to take this opportunity to wish not only my best man for my wedding, but the worlds best brother a very Happy Birthday today. Like I said, I am fortunate to have more than one sister, so the debate for the worlds best Sister can be debated, but the title of the World's best Brother goes to my little brother Gary. I always think back to the day when I was tall and thin with long hair and he was short, portly and bald. I don;t know what happened, but we kind of switched places through the years. If you see my Brother Gary today, make sure you wish him a very Happy Birthday. All good things must come to an end, and that even includes that things we work all week for called weekends. It's time to stick our noses back to the grindstone once again for another five day stretch after I do a final weekend reflection. Michelle's Dad was in town and we had a cook out yesterday here at our place. We through steaks on the grill and had a good ole time sitting around BSing a little. Jim, Chris and Amanda all came over and we spent a few hours talking about a variety of subjects. Dave is staying in town one more day and playing Lakeview again today. For me, I think I'm going to cut out my lifting this week and just do cardio all week. My shoulder has been sore and needs to recover and I think my kidneys were killing me yesterday. I'm going to cut down on soda significantly to see if that clears them up. Michelle's Dad is coming down today from Ohio to play a round of Golf at Lakeview. He and his golfing buddies select different golf courses around the area and go and play at them, today it just happens to be in Morgantown at Lakeview. Dave has been known to play golf roughly about seven days a week weather permitting. Michelle usually gets a daily update from the grudge match back home between him and his best friend Quinny. He is a golf pro and owns his own shop where he makes and manufactures custom fit clubs. After his 18 holes on the links he'll be stopping by here for a little cookout. We'll start marinating the steaks later this morning and I'll start soaking the corn here before long. Michelle's sister Chris who also lives in Morgantown and her Husband Jim will also be stopping by this afternoon for the cookout. We stopped by and seen them yesterday morning at their store downtown as we were doing a little bit of running around. Needless to say, we did our semi-annual carpet shampooing yesterday. We usually shampoo them once right before Christmas and once in the spring. A bit of consumer advice for those of you who shampoo carpets. You can pay $20.00 for a jug of the carpet cleaner from where you rent your shampooer or you ca go to Sams and get the concentrated carpet cleaner for less than $7.00 that makes 32 gallons of cleaner and get better results. This stuff is absolutely amazing, it doesn't foam too much and my guess is if you ran it side by side with one of those $20.00 a gallon carpet shampoo solutions you buy that it would outperform it. For less than $7.00 we figured we would give it a try, we were both amazed with the results. Here I sit once again in a quiet household, everyone has lost a battle with the sandman and I'm up early watching "I'm Gonna Git You Sucka" on HBO. Sitting here and collecting my thoughts for the day and the rest of the weekend. Michelle's dad is coming into town tomorrow to play Golf at Lakeview. He's coming over later than evening for a BBQ and he wants a good steak. So I think we're going to go out today and get some good steaks and probably some roasting ears for tomorrow. He's never been here, so Michelle is rather excited for the visit. Other than our normal shopping today, there isn't too much planned. We do plan on watching the third part of the Hatfield's and McCoys. We've watched the first and second parts of the mini series over the past couple of days, today we're going to watch the finale. I have to say it was a very well done mini-series. It's kept my interest the entire time and has me wondering what was going to happen next. It's on the History Channel today running all three episodes, might want to set up the DVR's. Well I don't think that the weather is going to be as nice as it was last weekend, you couldn't be lucky enough to get two weekends of weather like that in a row, but it's still Summer time even though it's calling for rain this weekend. If you are looking for a little bit of cheap, and when I say cheap I mean free entertainment this evening Movies on the Mon has their first movie of the season tonight at Hazel Ruby McQuain Amphitheater this evening with a free showing of the movie Cars 2 . BOPARC will also be doing the family fun fest from 7:00-10:30 tonight and will feature a variety of family-friendly activities including the BOPARC Art Cart, WVU Healthcare Bounce House, Games and Giveaways! The WVAQ Boom Box and DJ's will be on hand leading the fun from 7pm-9pm.